You gain 50% Experience Point bonus from all sources for 30 minutes. The timer pauses when you are offline and resumes when you return. This bonus is compatible with other foods or drinks. First of all it increases all received experience by 50%! That means you can level up much faster. This potion may look useless for characters below 50th level. Advancing from 1st up to 50th level is pretty fast and you can easily do it without any experience boosters. But advancing from VR 1 up to VR 14 takes much more time… That’s why this potion is amazing. It allows you to get more experience from all sources and level up faster! It affects not only Experience but also Champion Points. The second great characteristic of this drink is that it can be used with other food. You know that a character can benefit from only one food buff at the same time. You can’t benefit from multiple buffs. But that’s not about Psijic Ambrosia… You can use it anytime and it will not replace you primary food buff. Psijic Ambrosia can be crafted by Provisioners. You need to have Recipe Improvement Level 6 and Recipe Quality Level 4. That’s pretty high requirement so you need to level your Provisioning skill in order to be able to craft this amazing drink. By the way, Provisioning has very good passive that makes all drink and food effects last longer. This can be great bonus. Psijic Ambrosia is very difficult to craft and extra buff duration is always great. 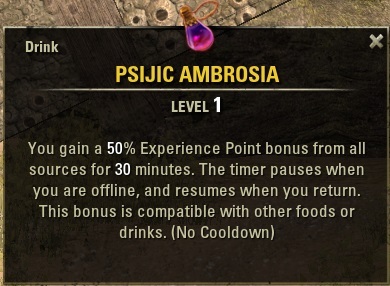 First of all you need to obtain Psijic Ambrosia Recipe. This is the toughest part because the recipe consists of 7 fragments. These fragments can be obtained from Daily Crafting Quests. Every day you can complete 1 Provisioning Quest and get a reward. Sometimes you will receive a part for Psijic Ambrosia Recipe, but the chances to get it are low. It may take a lot of time before you collect all the parts. It’s recommended that you ask your friends for help. If you have familiar Provisioners, ask them to share (sell) parts of the recipes if they have them for sale. You also should help your friends if you have duplicated pieces. This will make the process faster. Once you have all 7 parts of the recipe you can unite all of them into Psijic Ambrosia Recipe! Now you need to add it into your Recipe book and you can craft Experience Boosters! Don’t forget, that the recipe will be destroyed after you read it and learn. You will need only 3 ingredients: Frost Mirriam, Berverz Juice, Perfect Roe. But all the ingredients are rare and are very difficult to find! 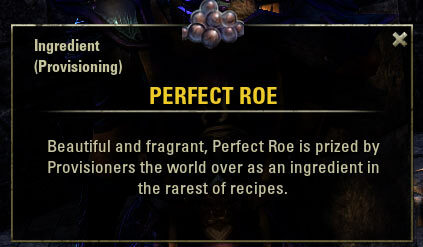 Perfect Roe – can be obtained from fishing only! It’s the rarest ingredient. If you want to craft XP potions you will have to fish a lot! Fishing is pretty simple in general. You catch fish and then double click it to find out, what’s inside. It’s pretty much like refining ores and deconstructing items in blacksmithing. Most of the time you will receive simple ingredients for provisioning, but sooner or later you will get Perfect Roe. You will have to catch a lot of fish in order to receive several Perfect Roes. Tips: You can get Perfect Roe by cleaning common fish. You don’t need special bait and you don’t need to look for rare fish. Catch common fish only. You also don’t need to be in a group. Just go fishing in any water type and sooner or later you will succeed. Frost Mirriam and Berverz Juice are also required for Psijic Ambrosia. These ingredients can be obtained from Daily Provisioning Quests. They are relatively easier to get than Perfect Roe. After you received all the ingredients, visit Provisioning crafting station and make the potion. As you see crafting XP Potion is a very difficult task. It will take a lot of time and to be honest not every player may want to spend this time for getting 30 minutes experience boost. Anyway, having this recipe in your Provisioning book is great.